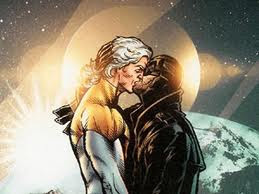 My second favorite gay comic book couple, after Henry Rollins & Glenn Danzig, is definitely Apollo & Midnighter. 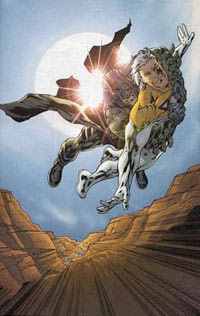 Originally from Wildstorm's "Stormwatch"they would later go onto become founding members of "The Authority". Essentially these two are a much hotter, cooler, gayer version of Batman and Superman. Apollo derives his power from the sun, granting him super strength, flight, speed, and all manner of sun based powers. He's light hearted and optimistic. While Midnighter is dark and brooding, he has the ability to foresee every possible outcome to any combat situation. He also seems to have superhuman speed, and strength. I've always appreciated the non-stereotypical portrayal of them over the years. They've managed to warm my gay heart, and never seemed to slip into lame, prime-time sitcom, parodies of what America thinks gay people act like. Plus for all of us faggy, fanboy, fetishists, they bring the leather and spandex!